Spending time outdoors during the summer months inevitably increases your chances of pesky insects biting you. Amongst these warm weather pests is the horsefly. Big, and striped with black underbellies, horsefly bites can be painful, irritable, and on rare occasions lead to more serious infections. So, just what do you do if one of these critters bites you? What Does a Horse Fly Bite Look Like? Horsefly bites are often painful due to the fly’s hook-like jaw which cuts into the skin, resulting in a small puncture. This may cause a sharp piercing sensation, followed by a burning feeling and possibly a bruising of the skin. Most common of these symptoms is itchiness, and the wound may well inflame and swell. Should the wound become infected, you may experience nausea, dizziness and severe swelling of the face, hands and feet. See a medical professional if these symptoms occur. Bites from horseflies generally take longer to heal than other insect bites and carry an increased risk of becoming infected. To reduce these risks, wash the wound thoroughly in clean, warm water using a cloth or cotton wool, and apply over the counter ointments or sprays to limit the irritation. A cold compress can be used for around ten minutes to reduce swelling. Ensure that you do not scratch or itch the wound, however tempting, as this will prolong the inflammation or even infect the bite. Usually, horsefly bites will heal on their own in a matter of days. Should symptoms persist or worsen then consult your doctor. Warm weather and low winds during the summer months are when the threat of being bitten is highest, so take precautions when outdoors during those months. With horsefly bites, prevention proves to be the best cure. 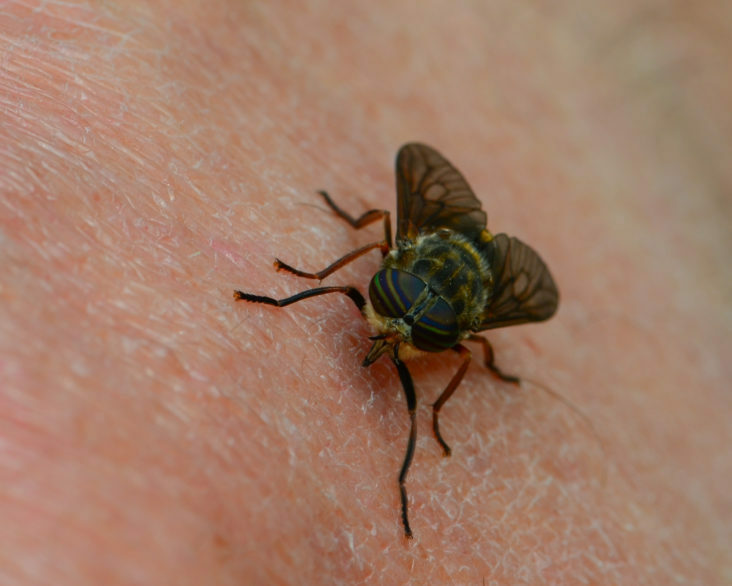 Living in rural and agricultural areas, horsefly bites are best avoided by wearing long sleeves and long trousers when walking in these areas or near water, where the flies breed. Likewise, wearing long trousers and toe-covering shoes is required when walking through long grass. Insect repellent may also be applied to avoid unwanted bites. These insects are attracted to darker colours and scents, so donning a lighter shade and ditching the perfume may help limit unwanted horsefly attention. You can also invest in a Horse Fly Trap which is a portable device that you can hang anywhere and it will help to get rid of 95% of horseflies and wasps! While horsefly bites can be painful and irritable, they rarely lead to further allergies or infections, and most heal by themselves. Preventing bites during the summer months is possible if you follow the precautions above.